The Microscopy Tool provides convenient access to and use of controls for precision, optical microscope systems. For example, users can fully control the motion of a microscope's stage in the X, Y, and Z directions. The Microscopy Tool uses ActiveX components to control the stage and to capture single or multiple images from an attached camera. This tool can be used from within the Aphelion development environment or it can function as a stand-alone application. 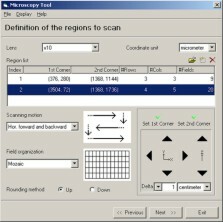 The Microscopy Tool is well documented so users can easily setup the interface to the microscope system. Motion control codes are available in an editable file to let users adapt these codes to their own specific uses or for non-supported stages. This tool supports Maerzhaeuser stages. Note: All controls available from within the Aphelion environment or through Microscope Tool as a stand-alone application. Users in the medical, metallurgy, and material analysis fields can now utilize the processing power of Aphelion Developer, combined with this extension tool, to analyze large fields or complex microscopy data. For instance, low resolution pre-screens can be combined with higher resolution analysis on specific areas of a specimen that warrant more attention.